Grab a dozen of your closest friends and enjoy a great day out, cruising Bribie Island while snags sizzle on the onboard gas barbecue. Bribie Island Barbecue Boats come in a range of sizes to cater for groups of 6, 8 and 12. And best of all, no license is required to operate the boats. Book early to avoid disappointment. Brisbane’s newly remodelled fish market is open 7 days a week from 7am, and is the perfect place to pick up a fresh catch for that relaxing summer’s day barbecue. The market offers a wide selection of fresh whole fish and fish fillets, all sourced from Australia and New Zealand. Arrive early to beat the heat (and the crowds) and pick up a snapper or two. Brisbane’s scenic South Bank Parklands mix riverfront promenade, man made beaches and rainforest into the perfect natural getaway. 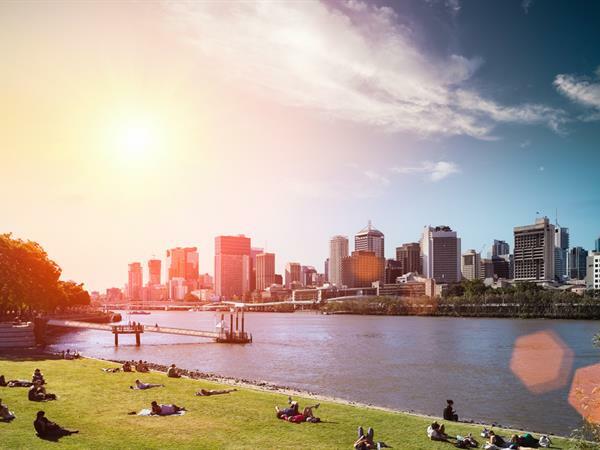 Located just opposite the city on the Southern Banks of Brisbane River, it boasts 17 hectares of lush parklands and a number of picnic spots to set up camp for the day. Take a dip, roll out a picnic blanket, or just stroll the surrounds in stress-free bliss. Located at Mount Coot-tha about 15 minutes drive west from the city, Brisbane Botanical Gardens feature over 56 hectares of exotic and native flora with guided and self guided walks, picnic areas and workshops. With enough room for the whole family, this could be the perfect spot to escape for a bit of post-Christmas rest and relaxation. After Christmas, the Boxing Day sales are a great opportunity to get out and grab a bargain, and they tend to extend for a few weeks over summer. Brisbane City boasts some of Australia’s best retail and shopping districts. Here are the favourite places to shop around Brisbane in summer. Brisbane’s famous Queen Street Mall boasts a number of top brands and stores, from international labels like H&M and Zara, to Alannah Hill, Myer, Country Road and ALDO. Take in the vibrant culture, stop for a coffee and a bite to eat, and explore over 700 retail outlets and flagship stores along this popular pedestrian mall in the heart of the city. Looking for boutiques and jewellery? Head to Brisbane Arcade where you’ll find vintage watches, dress shops, collectibles and trinkets. Located in Queen Mall, it’s the perfect spot to escape the hustle and bustle of the mall crowds. Don’t forget to take in the gorgeous architecture while you’re there; the heritage listed arcade reflects the archetype of the traditional 18th Century European shopping arcade, featuring baroque baroque style street facades, balustrades, dado panelling and original terrazzo stairs. Most Westfields shopping centres around Brisbane trade between 9am and 6pm. Queensland’s largest shopping centre features Hype, Ripcurl, Forever New, Tarocash and Event Cinemas. Located north of Brisbane near picturesque 7th Brigade Park. Carindale is southeast of Brisbane City. Shops include Myer, Peter Alexander, KOOKAI, David Jones and Seafolly. Quota Park and Bulimba Creek are located nearby. For those looking to escape the Brisbane City bustle, head north along the Bruce Highway where you will find Pandora, Just Jeans, Wallace Bishop Jewellers, Jeanswest, Footlocker and Watchworks among many others at Westfield North Lakes. Plenty of parking make it perfect for picking up a few bargains without getting stuck in the retail rush. Brisbane is a city that never sleeps. You may want to book a reservation beforehand, as brunching out is a popular pastime during summer. Here’s some of our favourite kitchens and culinary delights for eating out in Brisbane. Quaint and quirky with a splash of retro, Alfred and Constance has something for everyone. From shareable feasts at the Vanguard beer garden & restaurant to partying down at the White Lightning tiki bar and the late night dessert cafe. Unique menus, drinks, a party atmosphere with parking nearby, A&F is the perfect place to start the summer celebrations. Located in the heart of Brisbane amongst a grand heritage setting, Treasury Casino & Hotel offers all of its visitors a first class entertainment experience. Treasury Casino is open all through the holidays with a number of restaurants and eateries available. With stores all across Brisbane, from Clayfield to Albert Street, Doughnut Time is fast becoming Australia’s most popular destination for deliciously sweet and creative doughnut treats. We recommend checking out the ‘O Holey Night’ Christmas doughnut while you can. With many store locations open over the holidays it’s time to spoil yourself! If you’re looking for somewhere to host a fun summer lunch then look no further than Les Bubbles steakhouse and bar. This Parisian style steakhouse is located in the same building that housed the notorious illegal casino, brothel and bath-house at the centre of the Fitzgerald Inquiry. Featuring bottomless fries, French sweets, cocktails and wines from Little Wick, Les Bubbles welcomes all, and as such, vegetarian eaters will be taken care of too. While the hot tub downstairs remains, it will be the delicious food and drinks you focus on when you visit Les Bubbles. Head out to Eagle Street Pier and enjoy the modern and dynamic atmosphere of Sake Restaurant and Bar. Sunken tables, banquet menus, outstanding Japanese dining and plenty of sake await groups, friends and couples this summer. Bookings are essential. Recharge after Christmas with delicious pastas, pizzas, cheese, wine and dessert at Brisbane’s most loved Italian restaurant. Located in South Brisbane, the Spaghetti House Trattoria is open year round (except Christmas) and there’s no public holiday surcharge. Buon appetito! You’re truly spoiled for choice when it comes to choosing what to do for summer in Brisbane. With so many options of outdoor activities, shopping and places to dine, there’s something to please every member of the family!